Carry your extra watch when travelling. Love the the leather pouch it makes for a very nice slim quality watch pouch. I ordered the blue but recieved the black one. My Ferro Green airborne fits nice and snug in the pouch. The quality Ferro puts into there products is second to none. 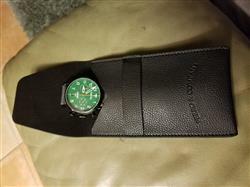 I highly recommended there watches and watch pouches.